Do you ever get tired of packing for a trip and trying to remember everything? I do, especially since we go on weekend trips occasionally and go back to visit our family. Since I got tired of remembering, I decided to go ahead and make an exhaustive list so I would never forget anything again. That’s where this vacation clothing planner (with spots for day & night!) and travel packing list come in! 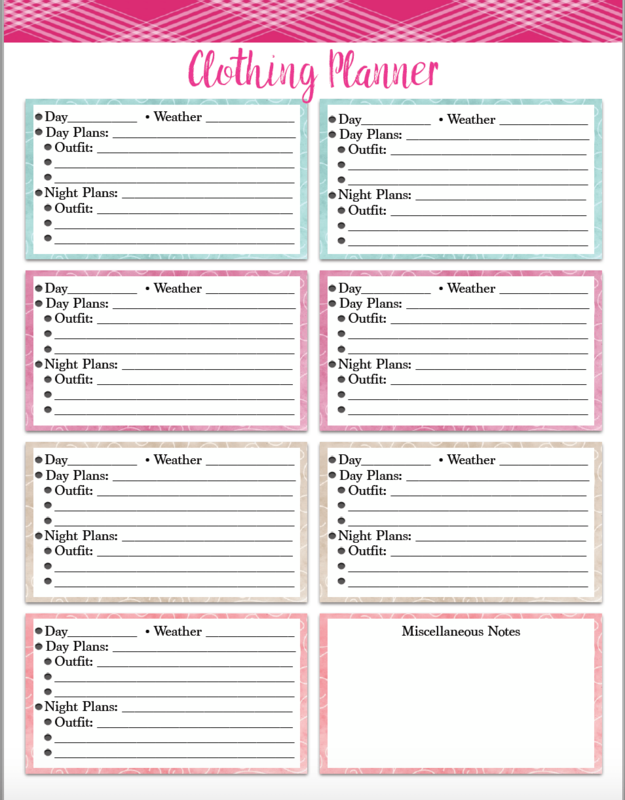 This travel clothing planner was actually a reader request. I had a basic one…but got feedback that they wanted to able to put different outfits for day and night. Ta-da! Here is is. It also includes a spot to label dates, note the expected weather, and to scribble down what your plans are for that day. Please note, I have never brought every single item on this list on a vacation. I just cross out the ones I don’t need; most of the document/finance will only be needed with overseas trips, some of the travel accessories are more useful if you’re flying, the men will obviously not use the make-up stuff, etc. This is an overly-exhaustive list. The way the formatting worked out, there is also a entire blank column for you to write in your own items. Dear readers, if you find anything missing that you take on vacation, please let me know, I will update and make a better, new improved list for the future. • Print options: just use regular paper. • All of the files are in pdf below. 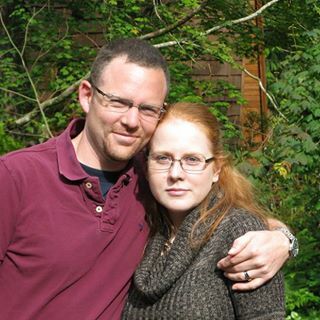 Or click on the image. It will open in a new window and you can either print directly or save to computer. • The default size of these is full-page. 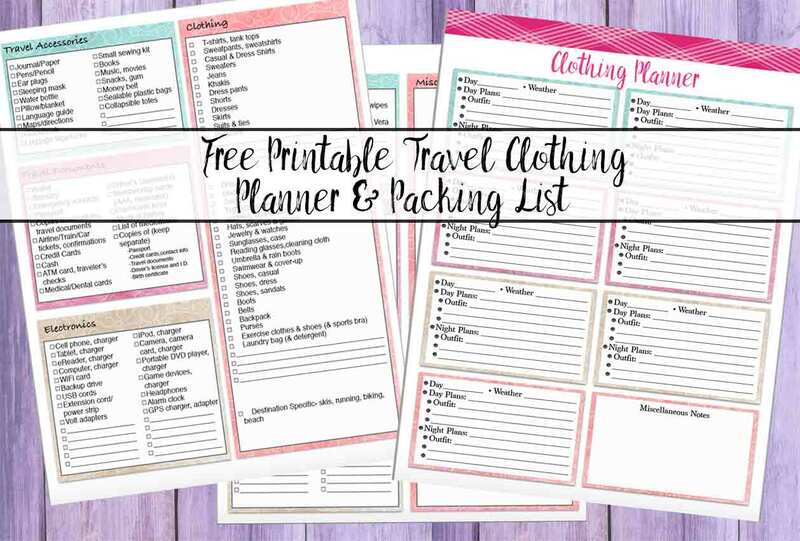 If you’re interested in the “single outfit” planner, check out “Free Printable Master Vacation Packing List & Clothing Planner” post. 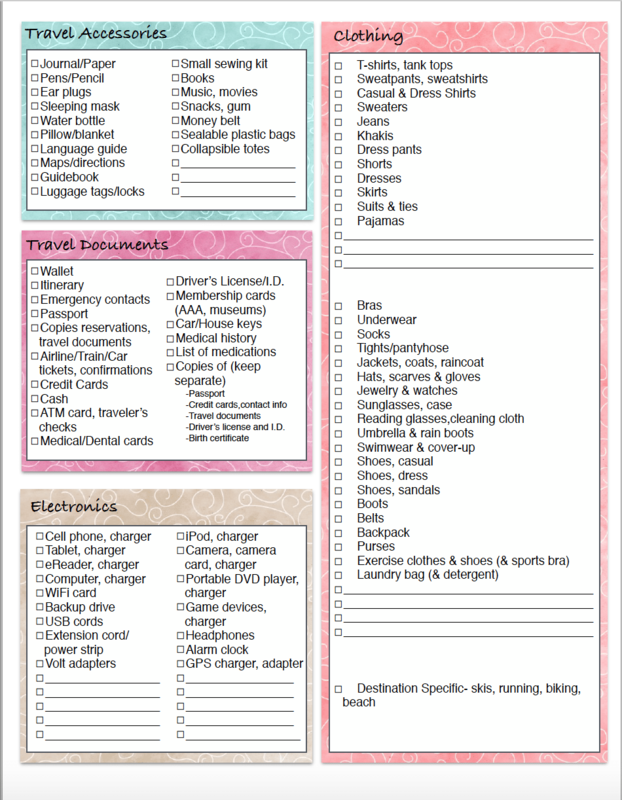 I also have free printable travel packing lists for kids! Check out the ones for: Babies, Toddlers, and School Age Children. This post contains some affiliate links for your convenience (which means if you make a purchase after clicking a link I will earn a small commission which helps keep my blog up and running but it won’t cost you a penny more)! Click here to read my full disclosure policy. 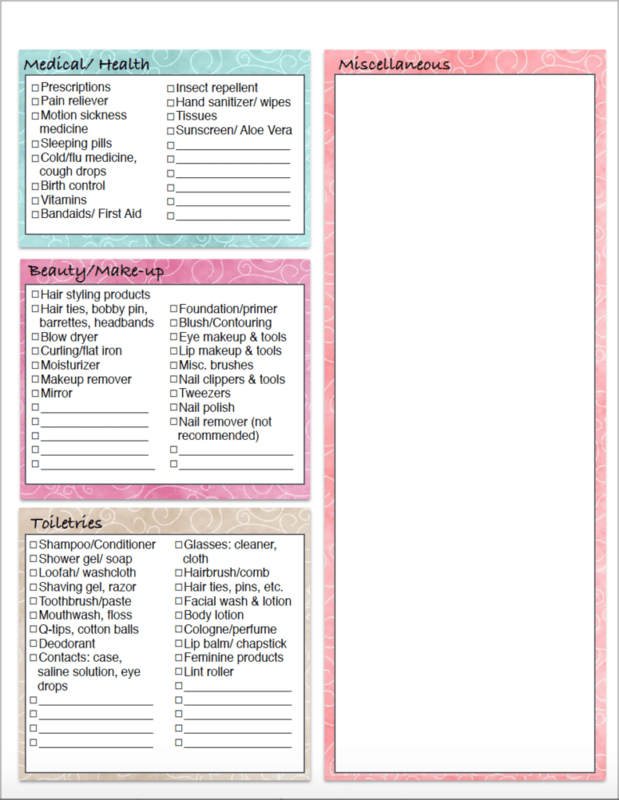 Portable Travel Toiletry & Cosmetic Case– I love this for a couple of reasons. One: I can just hang it up (it has a hook). Two: it has plenty of spots for storing every little thing I need. Travel Jewelry Organizer– Get tired of necklace chains getting tangled? This is the solution. Travel Jewelry Organizer– I’ve had good luck with this brand…or they’re just really well made. My favorite suitcase has lasted for over 10 years. Travel Jewelry Organizer– Love this concept! No more searching for electronic stuff! This is the travel clothing planner. There are spots for day and night outfits, the date, expected weather, and any notes about plans! This is an extremely exhaustive travel packing list. I have never taken everything on it. Just cross out what you don’t need! Both pages are in the same pdf file below.